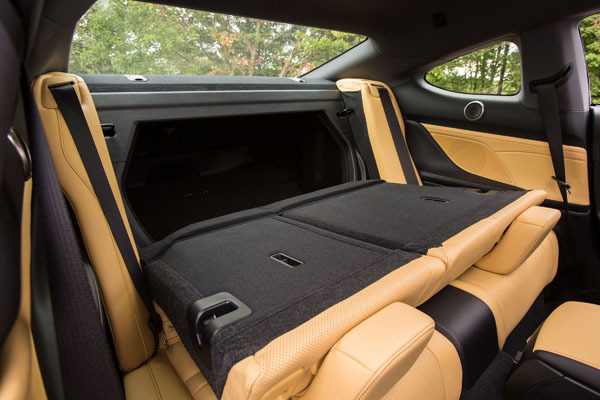 You love the dynamics of a sports car but you need something with a backseat…the 2015 Lexus RC 350 plays like a bad boy but still has room for your shopping bags. I wouldn’t call the 2015 Lexus RC 350 a family car. Not unless your kids thrill to lateral G Forces, and you’re the kind of mom who likes to show the PTA parents just who the Penelope Pitstop is among them. Rather, Lexus’ very refined new sports coupe is a bad @$% ride. In other words, an oxymoron. The 2015 RC 350 is a spirited, fast, and beautifully handling four-seater with two doors – not the ideal vehicle for carpool pick ups. 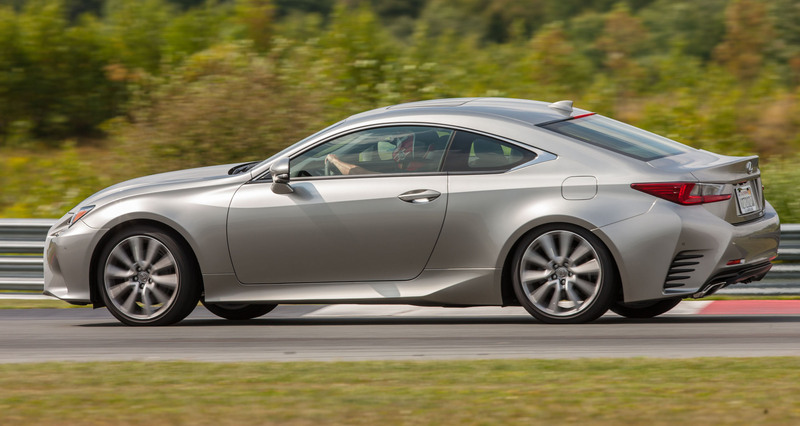 But if you love to drive fast, stop fast, and corner with abandon, then Lexus has your number: it’s the RC 350. And for sure, it is the new flagship sports coupe for Lexus that is likely to steer the company to a younger market (more on that later). 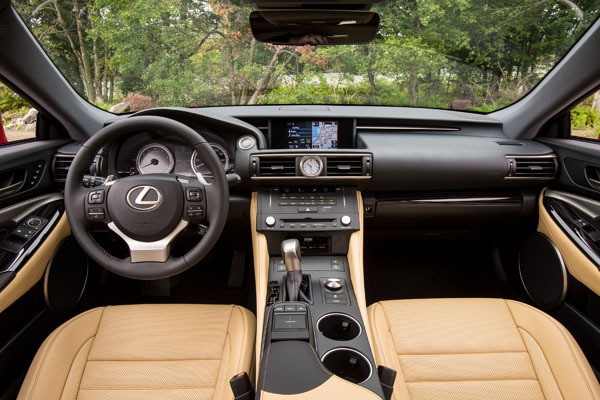 The 2015 Lexus RC 350 combines everything we love about sports cars with the creature comforts we’ve come to expect from a luxury brand like Lexus. It comes in three flavors: a base model (sounds so crass, but even the entry model is positively luxe), an RC 350 F Sport (think: badder, bolder, more growly), and an RCF model, which is so powerful it’ll reshape your muscles and give you a six-pack. Ha! Both the RC 350 and the RC 350 F Sport have a 3.5L, V6 engine that gets 306 horsepower. But in the F Sport edition, the foot pedals are a sporty aluminum, the front grille is sportier, as are the spoke wheels. Also, the F Sport comes with adaptive variable suspension, which changes the ride stiffness depending on road conditions. The 2015 Lexus RC 350 F Sport also gets sportier cladding on the exterior, for a sportier look, and sport-look styling inside. It sells for about $5,000 more than the 2015 Lexus RC 350. If you’re out of control when it comes to loving a sporty ride, then the 2015 Lexus RCF is your dream car. It wears a 5.0-liter big V-8 engine that produces a nutty 467 horsepower. Go big or go…well, to a racetrack, maybe. It has an 8-speed transmission, super powerful Brembo brakes, and comes with top-of-the-line Michelin Super Sport tires. We love all three versions, and were lucky enough to test them on a track. So we know from what we speak when we say…Dang, that’s one fine sports coupe. Super speedy, excellent brakes (ya gotta feel confident that the beast will stop, right? ), and great fun to drive. The 2015 Lexus RCF sells for $63,325. So now that we’ve established that the 2015 Lexus RC 350 is a veritable whiz-bang of a car, there’s one other thing. It’s also quite the well-mannered gent. As easy as it is to stomp on the gas and make the thing go, it’s also a breeze to drive around city streets, with no hint of the beast lurking beneath the hood. The 2015 Lexus RC 350 is a fine city car. 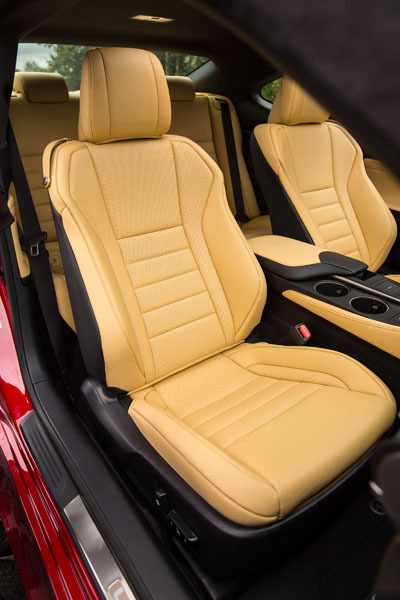 It handily maneuvers around tight parking spots, doesn’t misbehave while driving under normal conditions, and is supremely comfortable – indeed, its seats are some of best we’ve tested. If you’ve noticed a change in Lexus’ styling direction, you’re spot on. Lexus is in the midst of a transition, trying to retain its loyal customer base, while hoping to add a younger new customer to its roster. 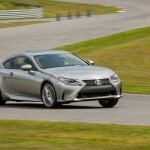 The exuberant RC 350 is Lexus’ latest new model that was built to grab the attention of a younger, sport-minded buyer. And while the 2015 Lexus RC 350 is sharper in every way, Lexus doesn’t seem eager to abandon its commitment to its core values of quality build and smooth-driving characteristics. To be everything to everybody, Lexus put a Drive Mode Select feature in the new RC 350. With the touch of a button, the driver can instantly change the RC 350’s personality from demure and smooth, to rowdy and ready for action. Seriously, this is a Dr. Jekyll and Mr. Hyde kind of personality switch that is real and noticeable. We Vroomies LOVE it. The 2015 Lexus RCF, quickest of the three versions, makes you feel like you’re a driving rock star. Whether or not you’ve had performance driving school (and we at VroomGirls always recommend that our readers take a performance/safe driving class to improve defensive driving skills), you will think you’re a genius behind the wheel. 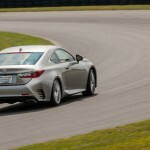 The RCF’s technology keeps the car firmly in corners, accelerates on demand, and handles so predictably, it makes you seem like a better driver than you probably are. According to Lexus’ Marketing Veep Brian Smith, the RCF’s performance is “communicated with a sledgehammer to the senses.” It blasts from 0 to 60 mph in a delightful 4.4 seconds. Whooohooo. The 2015 Lexus RCF comes in rear-wheel drive or all-wheel drive (for better traction) versions. The rear-wheel drive model gets 16 mpg/city and 25 mpg/hwy. 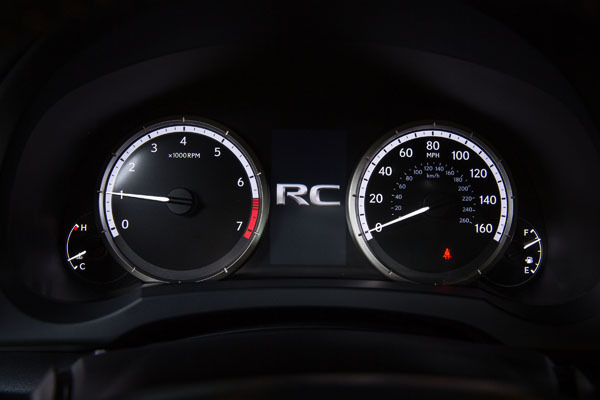 Should you wonder exactly how many Gs you’re pulling, you’ll get the answer on the Lexus RCF G Meter. It is a lap timer and G Force meter in one. Disclaimer: Note that 2015 Lexus RCF does not include an astronaut-inspired pressure suit that would allow you to withstand crazy Gs, so plan accordingly. The Lexus RC350, including the F Sport and RCF models, has 8 airbags standard. A variety of optional safety features includes lane departure warning, back-up cross-traffic warnings, and automatic emergency response in case of accident through Lexus’ connected driving program called Enform. The optional Mark Levinson sound system in fantastic. It has 17 speakers (yes, really) and 835 watts. Truly like the quality of your home sound system in your car. It comes with free HD traffic and weather updates, enhanced roadside assistance (in the unlikely event your very reliable lexus needs help), and a remote function that allows you to lock or unlock doors from anywhere in the world through your smartphone. Call it the Peace of Mind button. If you’re wondering what the F badge stands for (as in F Sport and RC F), it’s a nod to Japan’s Fuji Speedway – inspiration for Lexus’ push into the performance market. 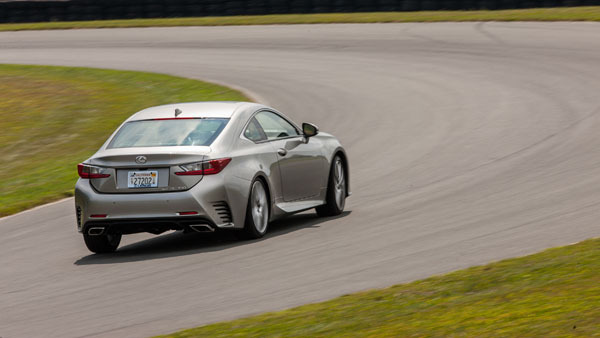 After a few laps around the track, we determined that the 2015 Lexus RC 350 will make an automotive enthusiast even out of those who hate to drive. 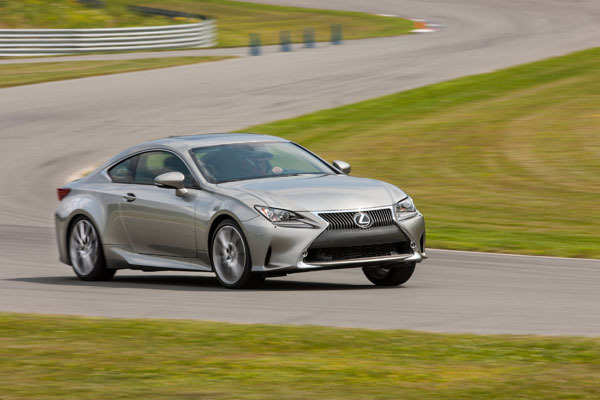 The 2015 Lexus RC 350 is dynamic, capable and absolutely fun to drive. It'll turn your daily commute into a joy ride. Lovely review, I’m ecstatic to test drive the F! I agree with you on the exterior, it could use a bit more work.. This review added my excitment about Lexus new family member. I tested drive the RC base model and falled in love with it. Since it is the first model I dont mind waiting before I puruchase it.